The brick walkway leads through the spacious side yard. This view is looking from the seating area toward the backyard. 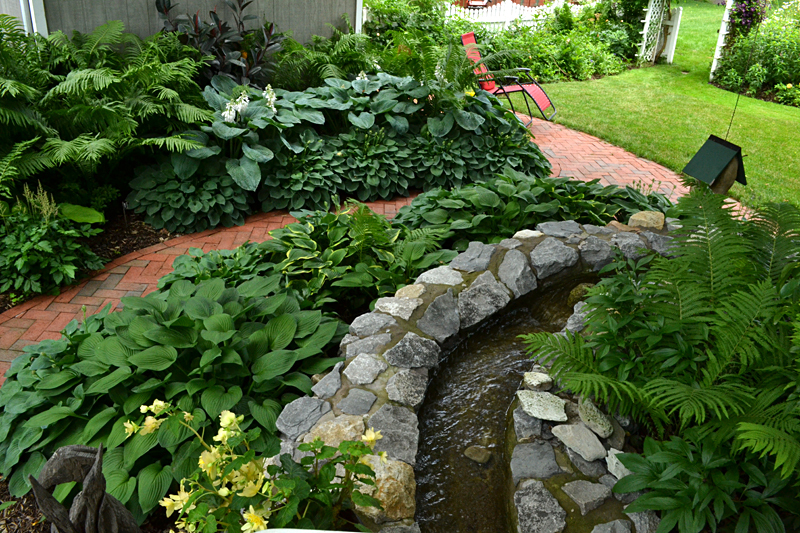 Handmade hardscapes are the highlights of the yard of John Taylor and Mary Brennan-Taylor of 480 Pine St., Lockport. 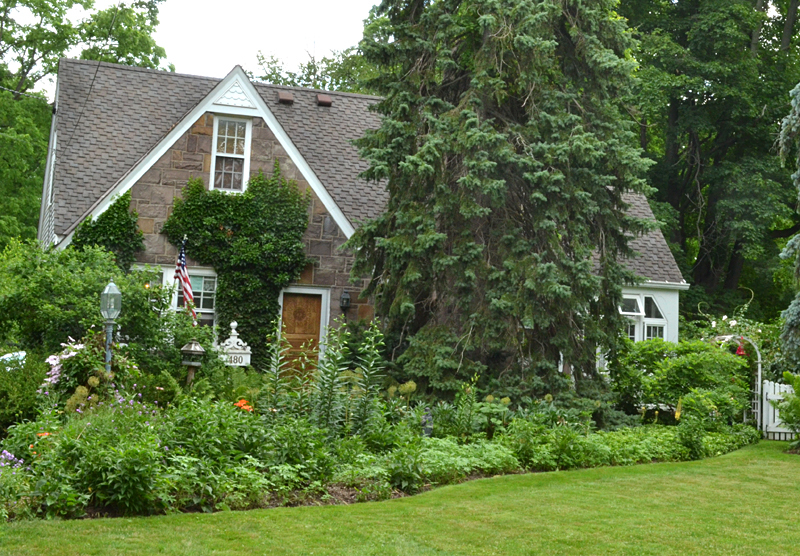 You can see their yard this weekend during Lockport in Bloom, a citywide garden tour to be held from 10 a.m. to 4 p.m. Saturday and Sunday, July 13 and 14. The event will also feature Twilight in the Garden from 6:30 to 9 p.m. Saturday only and a vendor fair 10 a.m. to 5 p.m. Saturday and Sunday. Maps will be available the day of the event at the Kenan Center, 433 Locust Street, Lockport. 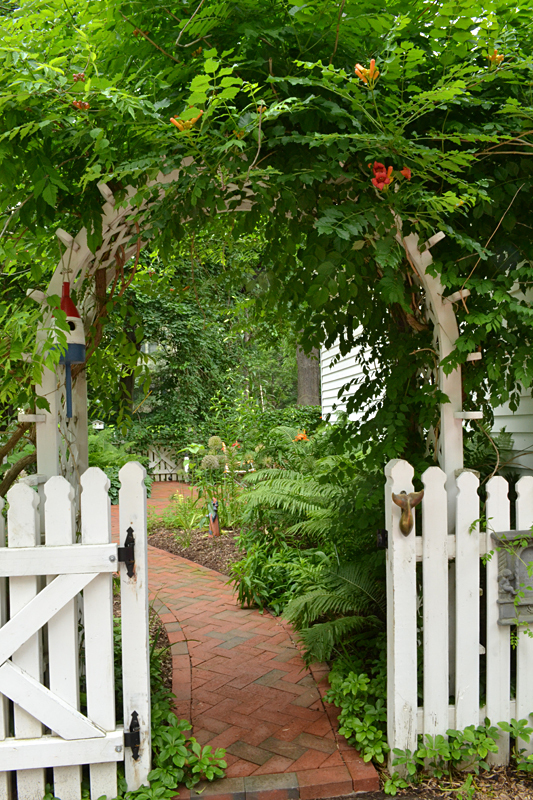 The arbor and gate to the right lead to the wonderful side yard. This is one of five garden walks to be held this weekend. 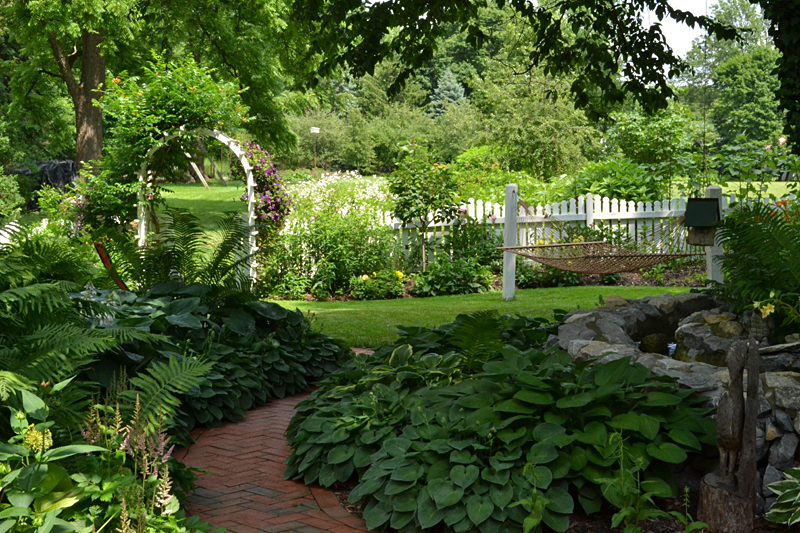 The Historic Niagara Falls Garden Walk and Samuel P. Capen Garden Walk will be held on Saturday, Buzz Around Hamburg Garden Walk will be held Saturday and Sunday, and Snyder-CleveHill Garden View will be held Sunday. 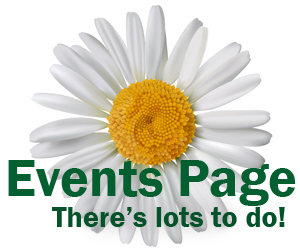 Get more details on the Upcoming Events page. In the photo above are the flower beds directly in the front of the Taylors’ house. To the right of the house you can catch a glimpse of the arched arbor and gate that is the entrance to the wonderful side yard. 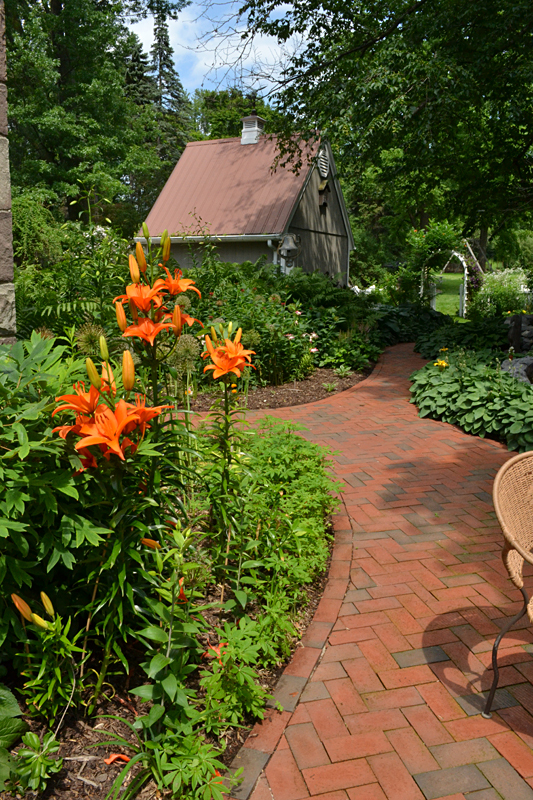 A red brick walkway that John built helps establish the beautiful courtyard area on the side of the house that you can see in the first photo. At one point the walkway is wide enough to comfortably accommodate a picnic table and benches as well as a patio table and chairs. “We spend a lot of time out here,” Mary said. John said that the biggest mistake most people make when creating a brick walkway is that they they lay the bricks in sand. This view is from the curved bridge. The stream from the waterfall twists and turns as it makes its way through the stonework channel. What he does instead is lay concrete first. He builds a grade slab using concrete with reinforcing wire and reinforcing bar. Once that is ready, he just puts a thin layer of mortar on top and lays the bricks in place. It takes a fifth of the time to lay the bricks once you have the slab in place, John said, and he insists the walkway will always be flat and level. But isn’t it expensive to build a grade slab first? “What’s expensive is when you have to take up the bricks every five years and reset them,” he said. John is laying bricks on his driveway, a project he hopes to complete by the end of fall. He estimates that the walkway and driveway will use a total of 18,000 bricks. Notice the short Japanese maple from Arbordale Nursery on the masonry structure. John designed the structure to accommodate the tree. 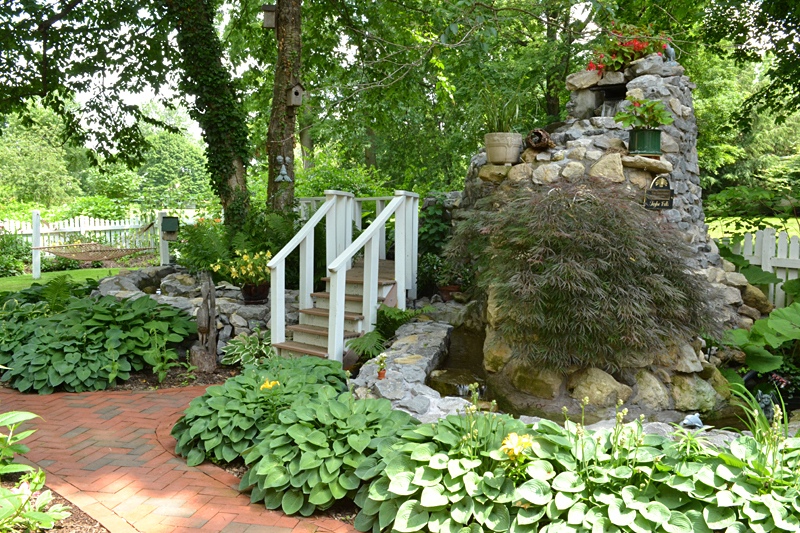 Just beyond the patio furniture is the grotto-like structure with a stream and waterfall that John built. It took ten years to plan and three years to construct, using 22 tons of stone. No, that’s not a typo– 22 tons of stone. In the photo above, you can see the steps leading up to the curved bridge; the back set of steps is angled to the left. John started by building the curved bridge first, and afterward built the masonry structure for the twisting channel and small waterfall. His reasoning was that you can’t bend wood, but you can shape the masonry structure any way necessary to fit around the bridge. He got the waterfall box and stream liner from Arbordale Nursery. The water starts 12 feet off the ground, just below the red flowers. From the small waterfall, the water flows down in a channel along the fence and beyond the bridge, curves around and heads back, flowing underneath the bridge and beyond the waterfall to a pool. This view is looking from the side yard toward the backyard. Just beyond the waterfall is a grassy area with a hammock. John made the pickets for the fence– it took him all winter. But there’s still more to see–The yard is 630 feet deep. 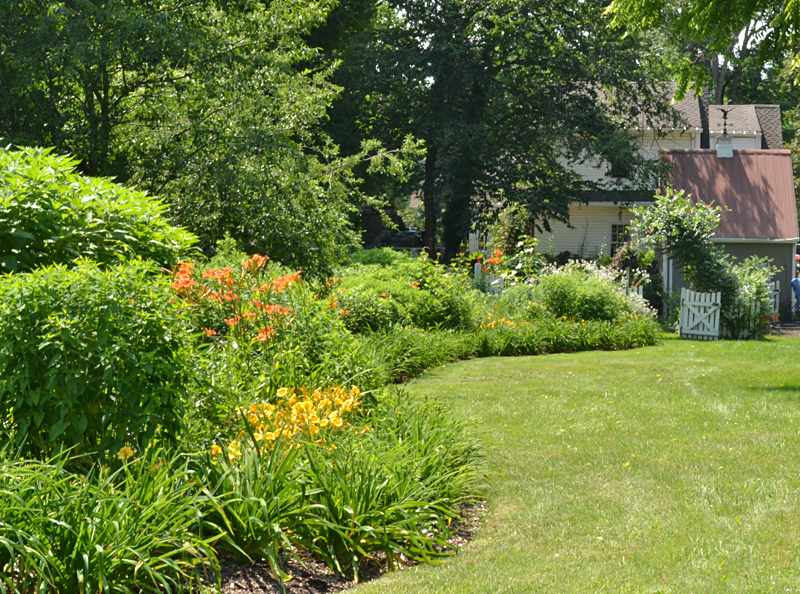 Outside the picket fence is yet another lush perennial border garden, which you can see in the photo below. This is the large border garden in the backyard. Behind us is the large vegetable garden. Even further back is a large vegetable garden. Except for the year that he broke his leg, John has had a vegetable garden every year since he was six years old. John built the arched arbors in the yard, which he says will support four times the weight supported by arbors that you buy. 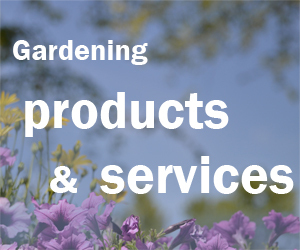 John’s love for gardening extends into the community. He started the Memorial Tree Garden on Market Street near Wide Waters in Lockport 26 years ago.